There are exceptions, but I am afraid the above is true for more than 90% of present day Japanese temples. I tried to focus also on some of the positive aspects of monks having a family, i.e. - the fact that without having a family, it is almost impossible to understand and share the suffering of so-called "common people"
This time I want to write about the danka system ("danka seido" in Japanese), which is another and maybe even more important factor for understanding the present state of Japanese funeral Buddhism. You might think that the degeneration of Japanese Buddhism is a modern phenomenon, that started only after monks married and families. But some say that celibacy was mostly a fiction even before the Meiji restauration. Be that as it may, the monks who lived three or four centuries ago probably weren't as holy and accomplished as we tend to imagine them to have been. For example, the late Endo Makoto, an anarchist lawyer and lay Buddhist, identifies in his book "Ima no o-tera in ha bukkyo ga nai (There is no Buddhism in today's temples)" the danka system of the early Tokugawa period (1668-1800) as the main reason for the entaglement of Buddhism and the Japanese statem and therefore the key for understanding why "there is no Buddhism in today's temples". So what is the danka system? For those interested, there is quite detailed information on the English Wikipedia page. Most of the article seems to rely on a German article that can be found here. The whole site Religion in Japan contains a lot of valuable information about the history and present state of Japanese religion. Unfortunately, it is all in German, except for one English page on Funerals in Japan, which is also important for understanding present day degenerated Buddhism in Japan. In depth articles on the danka sysytem can also be found here (Tamamuro Fumio, "Local Society and the Temple-Parishioner Relationship within the Bakufu’s Governance Structure") and here (Nam-Lin Hur, "The Rise of Funerary Buddhism in Tokugawa Japan"). Back to the danka sysytem. The system was originally established to monitor the whole of the Japanese society and thus supress Christianity, that had become a strong anti-governmental force in Japan in the early 17th century, especially in the Southern island of Kyushu. Christianity was forbidden and all Japanese were forced to register at one (and only one) Buddhist temple. Therefore the danka system is sometimes rendered as "family temple registration system". Not individuals, but the whole family was registered at one temple, usually simply the closest Buddhist temple they were living to. This temple was not only responsible for the spiritual needs of the registered families, organizing funerals etc., but also for the common education (at so-called terakoya (temple schools) - "Terakoya focused on reading and writing, but they dealt with extra subjects and disciplines, as counting with the abacus (soroban), history, and geography", from the Wikipedia article on terakoya), and maybe most important, the temples fuinctioned as village offices that issued official papers (just like todays ID papers) that were needed for travels, marriage etc. Temple priests were also expected to monitor their parish and make shure no-one would engage in Christian or other anti-governmental activities. The Tokugawa state resembled Orwell's "1984" in many respects, and the Buddhist priests worked as spies for the Big Brother. On the other hand, the most part of Buddhism was quite out of touch with the rest of Japanese society until then, and the new system forced not only the populace to register at temples and become Buddhist regardless of they wanted to or not. It also forced the priests to pay attention to the needs of a parish, work for them both as spirtual mentor but also as a kind of village head, organizing communal activities, functioning as a head of school, caring for both young and old. Soto tempkes even functioned as a kind of drug store, as they sold the Chinese medicine produced at the Doshoan in Kyoto, a Soto temple and medicine store that is connected to a relative of Dogen's (Kinoshita Dosho) who travelled with him to China in the early 13th century to study medicine. So, on the positive side, Japanese Buddhism during the Tokugawa period was much more of an "engaged Buddhism" than it is today. Buddhism was rooted in the daily life of the local community. If there was a problem somewhere in the community, people would go to the temple and consult the priest first. Priests were politicians, teachers and doctors at the same time. Today, nobody would call a priests except if there is a funeral to do. - every single Japanese was registered at a Buddhist temple. - thus the clergy had to take responsibility for the local community and perform various tasks which were previously unconnected to the life of Buddhist priests. - every Japanese was obliged to ask and pay for Buddhist services, especially funeral services. - thus the temples were now supported by the parish, previoulsy they were supported by a few rich sponsors or the state itself. - on the other hand, all Japanese had a place inside the Buddhist framework now - previously a Buddhist funeral or a posthumous Buddhist name was a privilege of the aristrocracy, now it was available to all. There was discrimination though, especially in the case of the "sabetsu kaimyo (discriminative posthumous names)" which were given to the Japanese paria (hisabetsu buraku). - the level of literacy rose probably higher than in Europe or America at the same time, as almost everyone had access to common education in the temples. 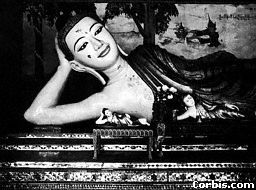 - common people also had access now to the Buddhist teaching which used to be an intellectual entertainment for the privileged few in the past. The sesshins of Bankei, the famous Rinzai Zen master, were attended by crowds of hundreds of lay men, including craftsmen and farmers, as well as monks. This would have been unthinkable in times before the Tokugawa period. - on the other hand, the Buddhist teaching and practice was gradually replaced by funerals and ceremonies for the ancestors (originally unconnected to Buddhism), and people came to think of Buddhism as a "religion for the dead". Because of this, eventually it became a dead religion. For three-hundred years, the Tokugawa policy was to control the monks with gluttony and warm robes so that they finally - like wild hogs that degenerate into ordinary pigs - lost their tusks and claws and allowed their marrow to be sucked out. Buddhists during the Tokugawa Era were completely happy to be yoked by Tokugawa policy. The fact that they didn't even consider themselves as religious is the reason for the current downfall of Buddhist teachings. Tokugawa Era Buddhism was just a governing machine disguised as religion. That's why it fell apart all at once when the Meiji Era suppressed Buddhism. For what were Todai-ji and Horyu-ji and all the other temples built? In the end, only to stable good for nothing monks. It's no surprise then, when there are monks who set Kinkaku-ji or Enryaku-ji on fire. The same goes for Ginkaku-ji as well. In the first year of the Meiji Era, the five-story pagoda of Horyu-ji was up for sale for 50 yen, and it still found no potential buyers. They did find somebody to buy the five-story pagoda of Kofuku-ji for 30 yen, but he only wanted to burn it down to gather up the gold afterwards. When they said to him, 'If you do that, the whole town of Nara will go up in flames!' he said, 'Alright, to hell with it!' This is the only reason the pagoda has survived to this day. The clergy was quick though to demonstrate its support for the new Meiji government with the Japanese emperor at its head. Sawaki himself was a stout supporter of the emperor during the war. But even this didn't start after the Meiji restauration. Even during the Tokugawa period, when the emperor didn't have much to say, the abbots of Eiheiji and Sojiji would make a pilgrimage to Kyoto to see the emperor and have them give a purple robe as a "present". In fact, the abbots had to bring the purple robe themselves, together with a donation for the emperial court. The cost for the whole procedure was, according to one scholar, about 2 million dollars in todays money. Monks would also pay the emperor for post-humous names given to the ancestors in the lineage. Even today, you will hear monks in Eiheiji talk of "Joyo Taishi" (literally "the great master who takes care of the sun"), no-one else but Dogen Zenji himself. In his own temple, he isn't known by his Buddhist name, but the name bestowed on him by the emperor, a secular human with no special connection to the Buddha way. Dogen Zenji even has a second secular name which is less known, "Bussho Dento Kokushi" (literally "the national techer who transmitted the Buddha nature to the East"), also bought from the emperor by later generations of Soto-shu priests - as if one secular name was not enough. This is another proof of the century long connection between the state and the clergy, who put the emperor above the Buddhist ancestors and even today isn't ashamed of using the secular names for Dogen or Keizan Zenji in the head temples or in the ekos (dedication of merits) read daily during sutra services. Anyway, the downfall of the Japanese Buddhism did not start with monks taking wifes and having children.